Everyone told me to check out Top Paddock. One friend said it’s the best breakfast they’ve ever had. Aussies take breakfast very seriously (almost as seriously as dinner), so that’s a pretty big call. I wasn’t disappointed. We were greeted by the busy, but very friendly staff and a wood fire. It was a beautiful warm welcome coming straight from an early morning flight in the winter chill. The menu offers something for the Paleo or gluten-free diner, to the traditionalist. There are simple eggs any way on toast for about $10 to the Top Paddock (below) for about $20. There is single origin coffee too, if you need a heart starter and a cabinet full of naughtiness if you’re stopping in for a sweet treat. Seedling Cafe was the perfect find while I wandering the famous laneways (or other fun free things in Melbourne) on a cold winter afternoon. A whole-in-the-wall cafe with a few cosy seats inside, what Seedling lacks in size it makes up for in friendliness and some very delicious food. The menu is all gluten-free with a Paleo persuasion. Get in early for their salads as they run out the door. Make sure you try a bulletproof or a matcha latte to keep you fuelled to continue an afternoon of shopping. A go-to for a quick, delicious lunch every time I am in Melbourne city now, Laneway Greens was exactly what the city needed. You’ll find balanced nutrient dense macro-style bowls of vegetables with protein like salmon or chicken with lots of vegetarian or vegan alternatives. The smoothies are super tasty and deceptively filling so opt for one or the other. A must try in Melbourne. Feast of Merit is really the definition of conscious eating. It’s a communal dining house with a menu built on local, sustainable and ethical ingredients – slow food. Their philosophy goes a little deeper though. It’s based on a tradition out of Nagaland in far North-eastern India. If someone comes into wealth they can choose to share it with the rest of the community by holding a feast of merit, so everyone can benefit from their windfall. At Feast of Merit, all the profits raised go to funding youth education and leadership programs at home and in Malawi, Ghana, Rwanda, Bangladesh and Cambodia. The menu is equally thoughtful. From the locally cultured butter and jam, to slow cooked pulled lamb and Shakshouka eggs on the breakfast menu. For lunch and dinner you’ll notice pickled veggies and locally sourced chicken and beef, not to mention lots of vegetarian and gluten-free options. The menu warms you just by reading it. Pulling in the plant-based crowd Seratonin Eatery serves up a creative and colourful menu featuring everything from their version of smashed avocado to beautiful Nutrition Bomb bowls full of healthy vegetables, eggs, nuts, seeds and ferments for a balanced brunch. We love that they also have a healthy kids menu which can be hard to find around town. Don’t leave without taking home a raw treat. Combi is a clear favourite for the Melbourne vegan and raw crowd. It’s no surprise they have now expanded with a gorgeous sister store in Byron Bay. Think superfood bowls, colourful smoothies, chia pots all perfectly plated for that perfect Instagram update. I’ve been dreaming about seeing these Pana Chocolate creations in person for a while. So instead of drooling over a photo online, I popped into their Richmond shop, for a Pana Pop. It’s a small shop front with a case full of hand-made delights. If you haven’t tried Pana, perhaps don’t – it’s very addictive – but not because of the high sugar content or additives, it’s free of all of that (although it contains Agave). It’s hard to believe it’s just raw, organic, chocolatey goodness. And everything is made on site. On the hunt for a green smoothie or Acai bowl? Nutrition Bar is a great pit stop. 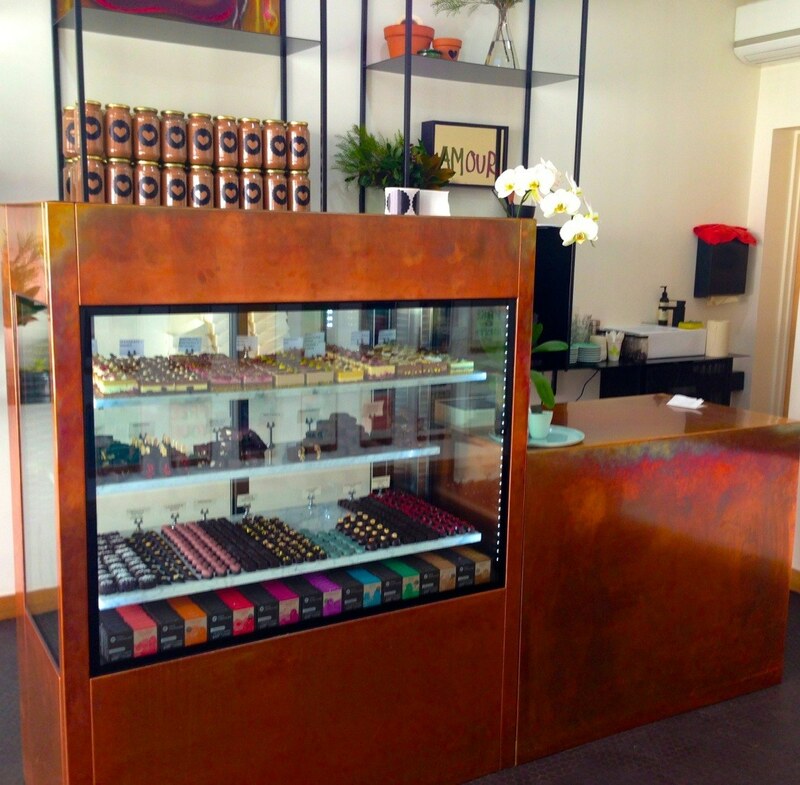 Their cabinet is stocked with lots of ready-made meals from salad to raw protein or cacao balls and cold drip coffee. They can whip up smoothies and fresh juices while you wait too. It’s a busy joint and the food and coffee is amazing so everyone wants a piece of the action. Despite the heavy waiting time warnings online, we risked it on a Saturday and took a seat in about 10 minutes. The staff is super friendly and as trendy as the place itself. No surprise there, as it’s up the road from the shopping district. I chose the charred greens with chorizo and labne. It tastes as good as it looks. The Hubby inhaled the almond milk porridge with rhubarb and honey. If you’re not keen to wait around for a table, the cabinet is full of take away options and they offer a number of coffee options, including single origin and a V60 pour over brew.